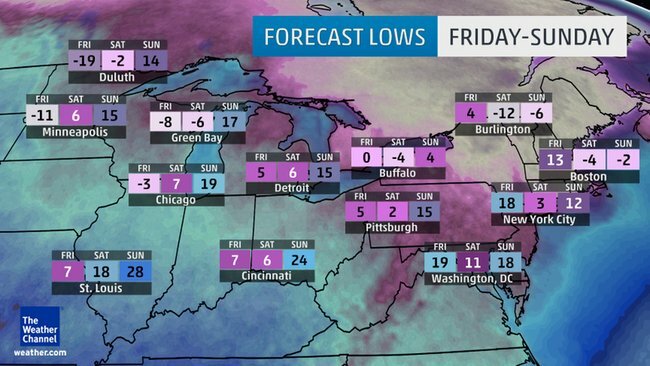 The coldest air of the season is poised to plunge into the Northeast this coming Valentine's Day weekend. This Arctic blast will not only flirt with some daily records, but will also bring subzero cold to parts of the Midwest and reinforce the cold in the Southeast. 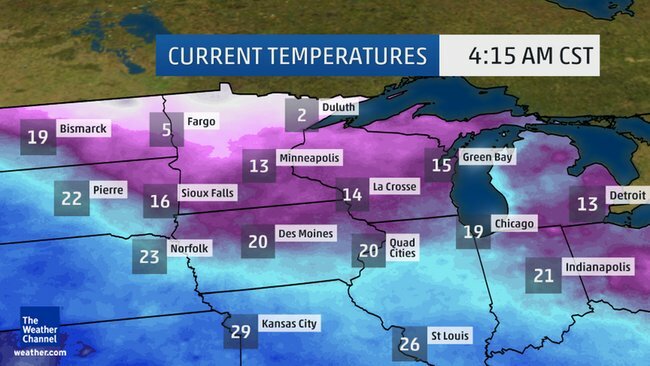 In addition to the bitterly cold temperatures, wind chills are expected to plummet into the 20s and 30s below zero from parts of the Midwest into the Northeast. 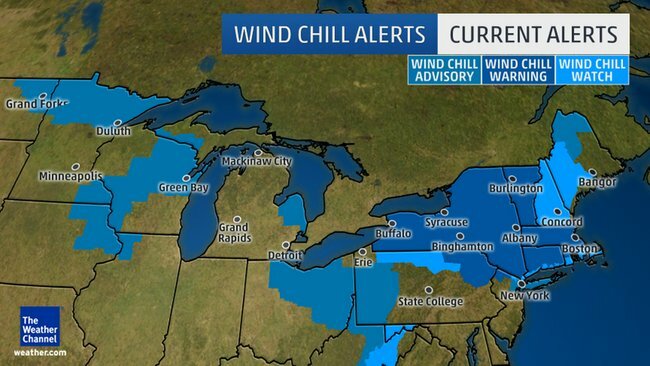 This has prompted the National Weather Service to issue wind chill watches for a large portion of the Northeast, where "life-threatening" cold conditions will be possible. A sharp southward nosedive of the polar jet stream will help tap an air mass originating from the Canadian Arctic and send it into the eastern half of the country from Friday through Valentine's Day. Wednesday night into Thursday morning wind chills dropped into the 30s below zero in northern Minnesota, including at the Falls International Airport. The coldest low temperature recorded on Thursday morning in the contiguous U.S. was 35 degrees below zero at Cotton, Minnesota. Let's first break out the timeline of shivering details, then explain why it won't last long. Friday: This potent cold will overspread the Midwest Friday, where highs will struggle to get much above zero in the typically coldest spots of eastern North Dakota, northern Minnesota, northern Wisconsin and the U.P. of Michigan. Saturday morning: Subzero lows are expected as far south as parts of the southern and eastern Great Lakes, as well as parts of the Corn Belt. Lows in the teens and 20s below zero can be expected in the Upper Mississippi Valley. Wind chills in the Great Lakes and Ohio Valley will be well below zero. Saturday: The cold blast arrives in the Northeast, mid-Atlantic states and surges into the Southeast. Highs will hold in the teens and 20s in the Boston-Washington corridor, with single digits and teens the most the thermometer can muster in the interior Northeast, Great Lakes, Ohio Valley and Upper Midwest. Some parts of Upstate New York may even struggle to rise above zero. Some daily record cold highs may be set in the Great Lakes and Appalachians. Sunday morning: Subzero lows are possible in southern New England and the suburbs of New York City and Philadelphia. Wind chills will be even more brutal with wind chills expected to be in the 20s below zero in New England with 30s below zero in portions of the interior Northeast. Farther south, lows in the single digits and teens will drive into the Piedmont of the Carolinas. Thirties and 40s will plunge into parts of north and central Florida. The Upper Midwest won't be quite as cold, but should still have some subzero lows, in spots. Record Lows Sunday: A few daily record lows are possible Sunday morning, but widespread record lows aren't expected. A few cities that may see records tied or set include Boston (-3 degrees); Worcester (-11 degrees); Providence (-7 degrees); Hartford (-9 degrees); Albany (-10 degrees); New York (2 degrees); Philadelphia (2 degrees). FORECAST: NYC | Philadelphia | Washington D.C.
Sunday: In the Northeast and Midwest, teens and 20s will be the rule for most on Valentine's Day. The Carolinas and Tennessee Valley will hold in the 30s and 40s. Some record cold daily high temperatures are possible in the Northeast, Ohio Valley and Appalachians. 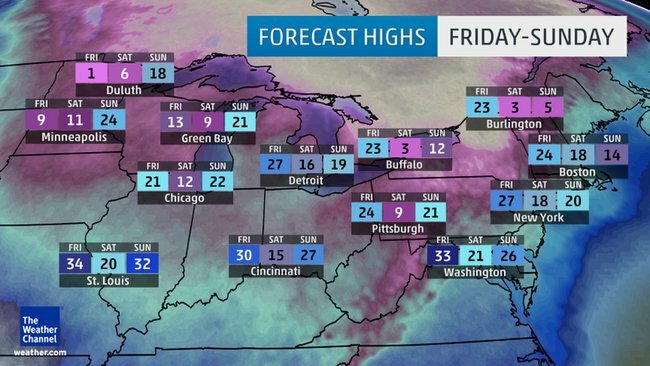 Several cities in the Northeast could see their coldest temperatures of the season so far this weekend. Boston's Logan Airport hasn't dipped below 0 degrees yet this winter, but could do so Sunday morning. Incidentally, subzero cold is quite rare in the city of Boston. They've only had nine subzero lows so far this century, three of which occurred last winter. Pittsburgh could also slide below zero Sunday morning, something that happened nine times last winter, but happens, on average, only twice each year. Now for the good news, if you're already starting to get a little winter fatigue. The bitterly cold air will be very short-lived. Temperatures will already begin to warm up a bit starting Monday. Above: Forecast surface temperature anomalies (above and below average) from the Monday evening mean of the ECMWF ensemble forecast. Note how the coldest anomalies (pink, purple, blue contours) largely disappear by next Tuesday at the end of the loop. The reason for this is another pattern shift next week. Essentially, the large northward bulge of the jet stream bringing record warmth to the West, including California and the Desert Southwest, will break down. Weather geeks refer to this as a switch from a positive Pacific-North American oscillation to a negative one. The corresponding southward plunge of the jet exporting cold air out of Canada into the Midwest and East will then also flatten out next week. Again, weather geeks would say the Arctic oscillation will switch from negative to positive, meaning the winds around the North Pole will be stronger, keeping the coldest Arctic air bottled up instead of plunging south. So, expect a February thaw after this weekend's shivering in parts of the Midwest and East by the latter half of next week.